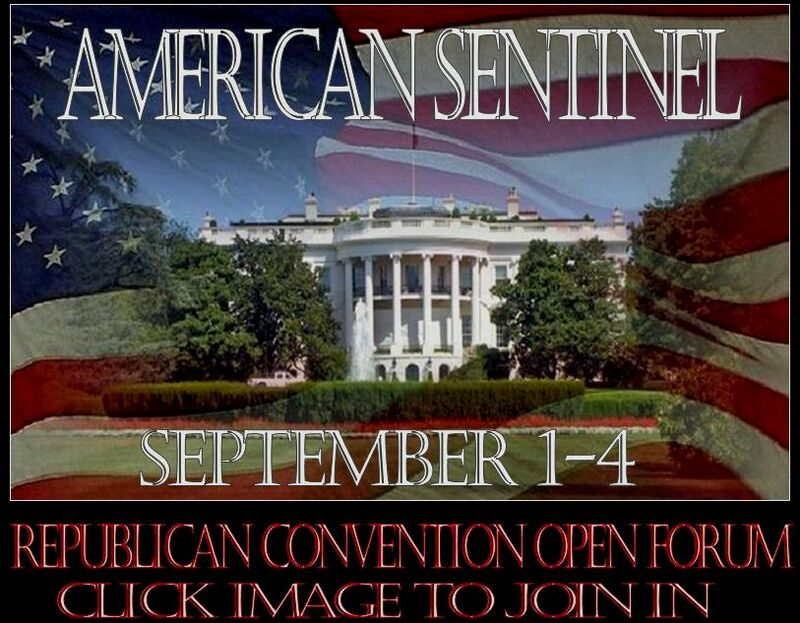 During the days of the Republican National Convention, the site American Sentinel will be having an open forum, with plenty of interesting, insightful – and dare I say funny as heck – political discussion. We had a similar forum for Barack Obama’s speech, and it was snort-milk-out-of-your-nose funny. If you tried clicking on the image and nothing happened, it was because I frankly don’t know how to install banner links. Just click on the html link above and it will take you where you need to be! I remember coming across a way to keep the perennially dumb occupied. You simply wrote, “See other side” on a card and hand it to them. That’s the way liberals are when it comes to America and foreign policy. 1) It is wrong for the United States to ever act unilaterally to resolve a threat to its security. 2) The United States must act in cooperation with the international community to resolve security threats. 1) The United States is disallowed from acting preemptively to deal with threats to itself. 2) The international community never does a damn thing until it’s too late to matter. In the minds of liberals, the United Nations has resolved crisis after crisis. In the minds of conservatives, it has allowed one genocide, crime against humanity, and security crisis to grow out of control after another. Liberals are wrong. Conservatives are right. But as long as liberals never actually admit that they’re wrong, they feel entitled to continue to play in the game of politics and international relations. And they can continue to dismiss the reality of evil and dither around with moral equivalence. And thus we come to the story of Russia, and its “peacekeeping operations” in Georgia and South Ossetia. You may remember that a couple weeks ago the European Union – with France taking the lead – negotiated with Russia to stop occupying Georgia and murdering Georgian people. Displaying all the courage that France has come to epitomize, the negotiation in effect allowed Russia to remain indefinitely in the guise of “peacekeeping.” If the EU ever offers to negotiate on your behalf, if you are wise you will tell them, “No, thank you,” and then run the hell away as fast as your feet will carry you. Well, this would be a shock to liberals, who believe in international diplomacy far more than they will ever believe in God, but the Russians haven’t been playing very nice. KSUISI, Georgia – After Georgian soldiers stormed South Ossetia and killed Vitaly Guzitayev’s friend, he hid in the woods. Once the Georgians left, he set fire to the elegant brick homes of ethnic Georgians who lived nearby. Arson gangs have targeted the homes of ethnic Georgians in breakaway South Ossetia as the conflict over control threatens to erase a centuries-old ethnic mix. Since the warfare between Georgia and Russia in early August, Associated Press reporters have witnessed burning homes and looting in villages in the region. The conflict has pitted neighbor against neighbor in this region of mountain slopes and fruit orchards where two ethnic groups have lived side-by-side for centuries: Georgians whose culture is rooted on the Black Sea coast and Ossetians whose language and customs point to the east. According to Georgia, at least 28,800 ethnic Georgians have fled South Ossetia in recent weeks, part of a larger exodus of some 160,000 people from the conflict zone. South Ossetian officials say the region’s population of Georgians was only about 14,000 when the fighting started earlier this month. Whatever the figure, no one disputes that there are few Georgians left in South Ossetia. And any who try to return will find many of their neighbors hostile, their language despised and their homes destroyed. Olia Bugadze, 68, is one of a handful of ethnic Georgians left in Ksuisi. She said she hid in a corn field as Russian troops swept through, then watched as neighbors descended on her home, looted it and set it on fire. Now she camps in the ruins of her kitchen. Georgian officials say some ethnic Georgian men were summarily shot by militia fighters in the aftermath of the fighting, a claim that the AP was not immediately able to independently confirm. However, an AP reporter saw dozens of ethnic Georgians — all middle-aged or older men — who were rounded up after the fighting and held in the basements of South Ossetia’s Interior Ministry. They were forced to haul debris on streets bombed-out by Georgian rockets and artillery. The AP saw at least three such groups escorted by armed South Ossetian policemen. Asmat Babutsidze lived in the hamlet Achabeti, a predominantly Georgian village in South Ossetia. After the fighting ended, she said, men with guns looted and torched her home and took her to a jail in Tskhinvali. There, she said, she was locked in a basement cell with 43 other women, most of them — like her — ethnic Georgians. Guards, she told the AP in an interview in Tbilisi, mocked and kicked the hostages. Women were forced to sweep the glass-littered streets, she said, while men were made to bury the dead. South Ossetian President Eduard Kokoity said some Georgian civilians were detained for their own protection, not as part of an effort at collective punishment. “The Interior Ministry protected them to save their lives,” he said. But Kokoity also said any ethnic Georgian civilians who sided with Georgian military forces will not be allowed to return. “We warned them in advance,” he said. David Sanakoyev, a South Ossetian government official, said a total of 182 Georgian civilians were detained for their own protection and that they were eventually bused to the Georgian side. The last group of 85 men was escorted to Georgia on Wednesday, he said. Georgian officials charge there was a coordinated campaign against ethnic Georgian civilians in Ossetian- and Russian-controlled areas. “It was a concerted action of Russian official military forces together with paramilitaries,” Eka Tkeshelashvili, a senior Georgian government official, said at a meeting in Europe in Vienna this week. Over the past three weeks, AP reporters have witnessed burning homes in more than half a dozen Georgian villages. On Aug. 11, an AP reporter saw looting by armed men in Georgian villages north of the South Ossetian capital of Tskhinvali — as Russian troops stood by. Another AP reporter saw burning and looting of Georgian homes in at least six separate areas from Aug. 22 through Thursday: the villages of Achabetiug, Kekhvi, Tamarasheni, Ksuisi and Eregvi, as well as near the capital Tskhinvali. With most Georgians gone, there seems to be an effort to erase even the memory of their presence here. On Thursday, a South Ossetian policeman knocked down a sign with the name of the Georgian village of Tamasheni, written in both Georgian and Latin scripts, as bulldozers razed the last remaining houses. At least three more Georgian villages have been bulldozed in South Ossetia, witnesses said. Human Rights Watch said Ossetian militias have been involved in systematic persecution of ethnic Georgian civilians. “They aim at pushing Georgians out of their villages, to make sure they have no place to return to,” researcher Tatyana Lokshina said. A Human Rights Watch team visited five Georgian villages in South Ossetia from Aug. 12-17, she said, taking photographs and interviewing victims. The team witnessed looting and burning in two of the villages, Tamareshni and Kekhvi. Until the last years of the Soviet Union, Georgians and Ossetians had lived peacefully. But as reforms weakened Moscow’s grip, Ossetians and Georgians formed nationalist movements, each staking a claim to their shared homeland. After Ossetia declared its independence, Georgian forces invaded, launching a full-scale war that ended in 1992 in a Kremlin-brokered deal that divided the region. South Ossetia fell within Georgia’s borders, but operated with wide autonomy. North Ossetia came under Moscow’s control. The uneasy peace that followed was marked by sporadic clashes, which intensified when Georgian President Mikhail Saakashvili came to power four years ago, vowing to assert Tbilisi’s authority over Georgia’s separatist regions. This only stoked animosity among South Ossetians, who believe Georgia has no right to rule them. On Aug. 7, Georgian forces launched a devastating rocket and artillery assault on South Ossetia’s capital of Tskhinvali. Russia mounted a massive military response, sending hundreds of armored vehicles south across Georgia’s border and driving the Georgians deep into their own territory. The Russians have accused the Georgians of attempting genocide, saying the barrage targeted Tshkinvali’s hospital and residential neighborhoods. They say its tanks rolled over people alive, and fired into basements where Ossetian families cowered. South Ossetian officials and the Russian military say they have done their best to discourage looting and arson and to protect Georgian residents of the breakaway republic, despite the popular anger at what they say was Georgia’s effort to destroy them as a people. “We are not barbarians,” Kokoity told the AP this week. South Ossetian officials say 1,692 civilians were killed and some 1,500 wounded in Georgia’s military assault — which devastated some Tskhinvali neighborhoods. At first Russia said about 2,000 Ossetian civilians had been killed. But on Aug. 20, it reduced that figure to 133 confirmed dead. “The truth is no one knows,” Thomas Hammarberg, the Council of Europe’s human rights commissioner, told reporters in Moscow Thursday. In Soviet times, Ksuisi residents say, Ossetians and Georgians lived harmoniously in the prosperous village surrounded by corn fields, grapevines and orchids with peaches and apples. Now the some 400 homes in the hamlet’s Georgian quarter appear to have been burned and looted. Of about 700 Ossetian houses, a small number — including a school — bore the marks of damage from Georgian artillery fire. Many Ossetians say their ethnic Georgian neighbors bear collective guilt for Tbilisi’s assault. The mother of Guzitayev’s friend, Lenya Doguzov, clutched the earth and wailed in an orchard that had been her son’s grave site before his body was moved to a cemetery. “Georgians should lie next to my son,” Yekaterina Doguzova, 70, said bitterly as she grieved alongside her daughter-in-law Zemfira Doguzova, 34. Lena Kudakhova, 67, of Ksuisi was married to a Georgian man killed in the recent fighting. Now her half-Georgian daughter is in hiding nearby, fearing retaliation, and her half-Georgian son has fled to the Georgian capital of Tbilisi. She wonders what will happen to her. “Nobody needs me in an independent Ossetia,” she said. Associated Press writers Mansur Mirovalev and Maria Danilova in Moscow, and Jim Heintz and Misha Dzhindzhikhashvili in Tbilisi, Georgia, contributed to this report. But liberals will continue to play the “See other side” game with the international community. Meanwhile, Georgia is still burning. And no one is doing a damn thing to prevent it. He suggested that Democrats would launch an all-out attack on that basis. Good. Let’s make experience the issue. Let’s make this years’ Presidential election a referendum over who has the most relevant experience. I found Begala’s argument a classic example of concentrating so much on rhetoric that reality was discarded altogether. On CNN’s Anderson Cooper 360 program, Begala attempted to make the argument that Sarah Palin had no experience in foreign policy. And that it was “shockingly irresponsible to place her a heartbeat away from the Presidency. When it was pointed out that, if anything, Barack Obama had even less experience, and that Barack Obama is actually running for President, Begala did not bother to respond to that issue. Instead, he framed it this way: 18 million Democrats voted for Obama, which is another way of saying that 18 million voters decided that Obama did have enough experience. However, in the case of Sarah Palin, only one man made that determination. Therefore Begala could rest at ease with Obama’s experience, and legitimately attack Palin’s lack thereof. Well, apart from the fact that 18 million other Democrats essentially voted that Obama didn’t have enough experience, there’s another problem: Barack Obama in actual point of fact doesn’t have any more experience than Sarah Palin. If 18 million Democrats decided the world was flat, it wouldn’t make it so any more than if merely one did. Not only has Sarah Palin been to Iraq, but she went there in her capacity as the head of the Alaska National Guard. Obama visited Iraq as the head of nothing. Further, Sarah Palin as Governor has actually negotiated with foreign governments, most notably Canada, Russia, Japan, and South Korea. Can Barack Obama point to an official negotiation with a foreign government? And, if it isn’t already obvious enough, Sarah Palin as Governor of oil-rich (as well as other experience in the energy field) is vastly more aware of the key energy issues than Barack Obama. And most certainly, as Governor, Sarah Palin obtained incredibly relevant experience as a senior executive. Nothing Barack Obama has ever done is comparable to Palin’s governing. Campaigning for President does not qualify one to be president any more than applying for medical school qualifies one to be a physician. So in considering Paul Begala’s frankly stupid claims, it’s rather hard not to have Shakespear’s “sound and fury, signifying nothing” quote come to mind. The big political knock on Sarah Palin is that she doesn’t have a great deal of experience. But, amazingly, that may become her greatest political asset, as unhinged Democrats, in decrying a candidate for Vice President’s lack of experience, actually underscore the lack of experience of their candidate for President. John McCain just turned 72 today, it is true. And he’s had skin cancer. But he’s been given a clean bill of health, his mother is 96 years old, and skin cancer is generally only fatal if is allowed to advance untreated. Sarah Palin, if elected, would be a heartbeat away from the Presidency, it is true. But no heartbeats would separate Barack Obama if he were elected. Instead, the most inexperienced American President in the last century would immediately begin to run the country at one of the most critical periods in the nation’s history. I have to laugh: an inexperienced Presidential candidate is fine. But an inexperienced Vice Presidential candidate? Well, there’s cause for all kinds of concern. I don’t think John McCain minds allowing experience to be the central issue of the campaign. One note: You can count on in-the-tank-for-liberals reporters asking foreign policy “gotcha” questions as a matter of routine between now and election day (something they somehow never got around to doing with Barack Obama). Do you know who the President of Bolivia is? You are currently browsing the Start Thinking Right blog archives for August, 2008.